BumRite Cloth Diaper Company: GroBaby or GroVia: What is the difference and which do I choose? GroBaby or GroVia: What is the difference and which do I choose? The Natural Baby Company in Bozeman, MT has re-branded their best-selling modern cloth diaper system: GroBaby is now GroVia - a Diaper for Every Family. What does this mean to you? SALE. We love GroBaby so much that we bought out the manufacturer's remaining stock! That is how confident we are in this product. We have been using it for 15 months on our son. GroBaby or GroVia: What is the difference and which do I choose during this transition period? 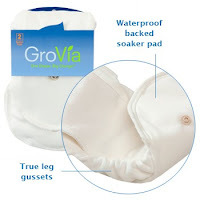 the new gussets on the GroVia soakers can contain the breast fed poop-plosions a little better. 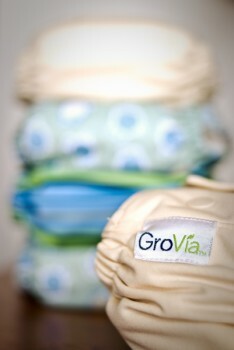 GroBaby and GroVia are interchangeable - save a little money by mixing it up. GroVia can accommodate a slightly larger build and/or older child with its extra 1/2 inch on the rise. You can retrofit GroBaby covers to snaps by sending them to the manufacturer within the first 6 months for free. Or for $3.50/shell thereafter. We hope this helps a little. Feel free to call us (707) 812-1BUM. I switched from gDiapers to Gro Baby when they went on sale. I only have about 10 covers and 8 soakers, but use the biosoakers more often than the cotton soakers. It took a little learning, but now I am in love. Gro Baby pretty much rocks my world! I like the idea though, that Gro Via shells have the tuck under tab for their "velcro" because my Gro Baby don't stay very secure in the wash. But, I wash them separately, so they don't ruin clothes! I think I'll give the Gro Via soakers a try too--I like the idea of the water proof backer... keeps shells cleaner longer! Thanks for the comparison Angela!